Conext XW Pro hybrid inverterGrenoble, September 20 – Schneider Electric, the leader in digital transformation of energy management and automation, has announced the launch of the next-generation hybrid inverter, ConextTM XW Pro. To address the grid interactive requirements in California, ConextTM XW Pro meets the Rule 21’s SRD requirements. This announcement follows Schneider Electric’s recent release of PREPA firmware for their ConextTM XW+ line of products to meet grid requirements in Puerto Rico. Since Hurricane Maria swept through Puerto Rico in September 2017, Schneider Electric has been working closely with local partners to restore power to the island, deploying thousands of systems in the past 18 months. The ConextTM XW Pro interoperates with solar charge controllers and most conventional PV inverters in AC-coupled configurations, which makes the product ideal for retrofit applications in both residential and commercial settings. The ConextTM XW Pro will initially be Rule 21 compliant, and Schneider Electric will release upgrades to compliance with other SRD requirements for the North American region. The initial launch of the XW Pro will be UL-only; Schneider Electric will launch an IEC version of this product in 2019. Conext XW Pro hybrid inverterSchneider Electric also announces the launch of the ConextTM Gateway and the ConextTM Insight 2, next-generation monitoring and control solutions for Commercial & Industrial solar and storage projects. The ConextTM Gateway supports Wi-Fi connectivity and comes with a wide range of other communications interfaces for integration with inverters, power meters, weather stations, Lithium-Ion batteries and much more. In addition to the ability to monitor systems remotely from the cloud, ConextTM Insight 2 will allow installers to manage system settings and firmware updates remotely. Sounds like improved hardware/firmware for on grid uses. Not sure if any improvements for us off grid types, or if this will be a replacement for the XW+. It really is not a replacement for the XW+. It does have some hardware that will make it not backward compatible but that could change also. The replacement for combox (conext gateway) and Insight 2 will modernize an XW system if desired. XW Pro is the same footprint as XW and XW+ BTW. The gear I am electronic field testing for offgrid looks solid. New features like dual xanbus systems allow 2 separate power systems and easy to monitor/control from anywhere without using techniques like port forwarding. Full control will allow the support guys to look into a system and load firmware. It is extremely secure and the owner can control who gets in or just lock it up. The wifi is a game changer as it will allow other devices like a heat pump or thermostat to get data from XW and use energy while it is there. Clouds causing panel output to vary can control loads and still have a full battery. Third party aps can easily be written for wifi devices and already have. Long xanbus or network cable runs can be a problem for some sites and so wifi will give a 3rd way to monitor/control a system. I have been begging for this! Even though the rule 21 is responsible for this getting this done, it is very nice indeed for Offgrid. New hardware arrived this week for CVT. I hear this is suppose to be done by December if anyone has buying shoes on. Looks as solid as I would expect. I am hoping this will be a way to easily automate home fire, theft, heating cooling and electric car charging for offgrid from Insight 2 anywhere! It has all of the digital/analog inputs and outputs. Hey Dave - I'm not sure if you can say, but is the Gateway a kind of upgrade to the COMBOX? Are there some things you can do with the COMBOX that can't be done with the Gateway, e.g. firmware upgrades? I was tentatively planning on adding a COMBOX to our system next summer, but if the Gateway already has WiFi and can do the same things, I might reconsider (although I guess the price might enter into my decision). You are right I can't say on the pricing but it definitely will be more just for the hardware. The engineering has to pay-off also for the shareholders to be happy. The XW pro also has higher rated components which will cost more. If you go back a few in this thread (#3) there is a picture of the New Conext Gateway. Here is a peak at the dashboard on a good day after 4 inches of rain. There is more firmware coming but it is getting close to done. 609w going into inverter from DC, plus 1w coming from grid = 656w AC out to loads? Pretty neat if the inverter adds 46w? Or maybe I'm misunderstanding what it's saying? Not sure what you mean by e-panel? DC bus? For rule 21 they need to show power into inverter (new) and battery. Yes the direction arrows have been put on the next revision. 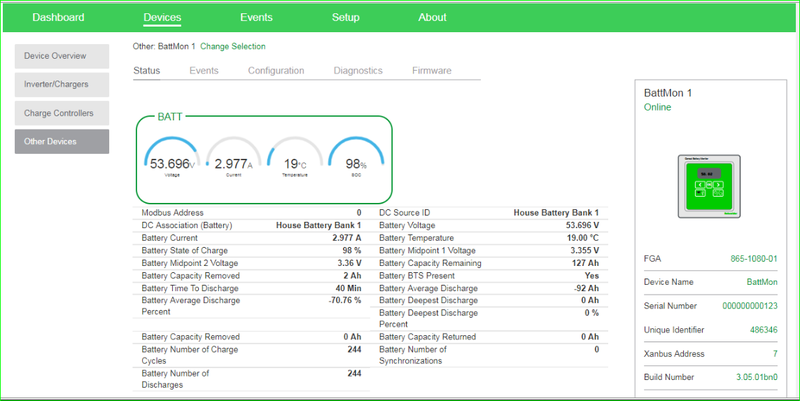 The state of charge, current and temp are also going to be added on dashboard as they were on combox. The colors of the devices do change if there is a fault or warning as combox did. Yellow for warning and red for fault. It is called the power distribution panel from when xantrex designed the xw. There is now the mini distribution panel that Schneider made for those wanting to save space in single inverter systems. Both are available and make an install clean. I've got an awful itch for this thing. All out current customers use a combox and controlling the system is a huge curse. We used to use teamviewer and an on site Raspberry pi that we would log into. Now we have a developer that made us a script that will have the raspberry forward the local combox data out to an AWS server which will then put it to a website for us. With all the satellite internet installs and double NATing, port forwarding is near impossible with it, but our work around works. To omit the raspberry pi, teamviewer, Amazon server subscription, will be a blessing. On my personal system I am planning on using "opportunity load" to have 'available solar' during solar happy hour, automatically modulate a variable speed water to water geothermal heat pump which will store energy in my 1000 gallon storage tank for use in heating our infloor heating system. That's the dream anyway! 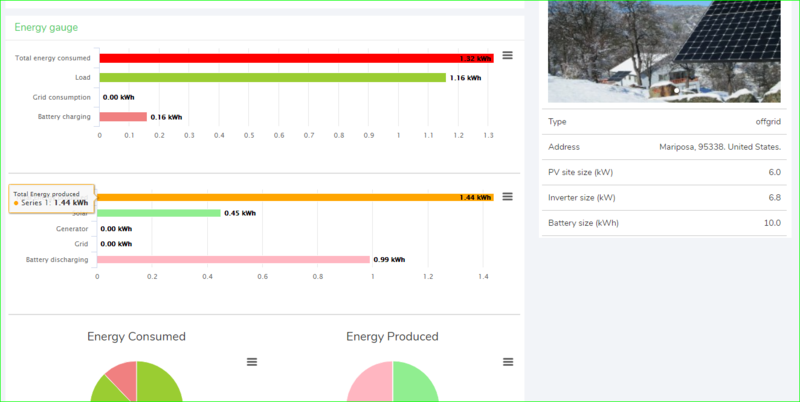 It fizzes me when my battery is full, the house loads are satisfied, and I have 8 kw of solar sitting there doing nothing while I burn 9 cord of wood each winter! I was planning on building a solar sensor to interface with an arduino as well as scrape data from an existing combox in order to dictate the geothermal output. They should have sent me one of these to test this! Oh well. Hopefully it will be awesome. I sent an email a few years back with a wishlist to Schneider electric but never heard back from them; this was one of the features that was on the tall order side of things. fowlerrudi have you tried combox on Insight 1? Insight 1 is monitor only. 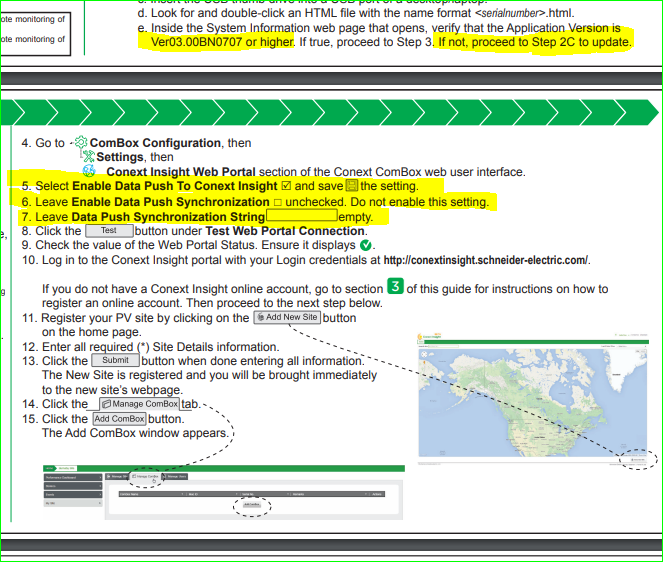 Conext gateway will have Insight 2 which will allow you to make changes and monitor. Quite a few other things as well. Yes, we have all the customers on insight, but it is read only. When I do this now, I use a cell into combox and it works very well read/write. Another thing new for XW pro will be charging based on Soc both grid and for genset. XWPro SoC charging is based on .... ??? i.e. SoC only via Canbus from a capable battery such as a Discover battery? Gather the Gateway's "wireless connectivity" is along the lines of it being a WiFi client, not as a router or LTE modem. So for offgrid, off net location - something like a Peplink LTE router/modem (or just a dedicated old smartphone on a wall wart acting as WiFi hotspot?) is needed eh? Perhaps another reason to upgrade that tired old phone that still just keeps working (mostly). Explain more please Mike! I have never seen what you are describing in over 50 systems I monitor occasionally and some all the time. To get combox to push now it has to be enabled. The gateway has places to shut down the wifi or the LAN, enable data push only or allow remote diagnostics. I am not sure what the defaults will be as Insight2 is still evolving for micro grid. Should know soon though. Because all your systems are wired to internet, you don't see this error. The system defaults to push data, and when the push fails, an error log is silently generated. Eventually, this fills the flash memory and the system locks up, stops logging, communicating (but at least inverting still goes on) one thing that happens is .AES files are generated, after a couple thousand of them the root of the SD card fills up and it's locked up too. "Make sure the "Enable Data Push To Conext Insight" is UNCHECKED "
I will mention it but I believe you are wrong on the default. Maybe in old firmware it did, but not anything in the last 3 years on combox. Many of my systems I watch are cell or hughs net. Thanks, it looks to me that the gateway can't do what you did when you had your problem. Firmware needs to be correct for settings to work. I tell my clients to keep a log for any changes they make because in the end, they are the ones responsible. The Conext gateway, XWpro, and Insight 2 should be available next month. The testing has gone very well here with only a few snags that got corrected. Insight 2 has been up on the web for about 2 months and works very well at controlling all xanbus devices remotely and monitoring, without any special connections to an ISP or Cell. Below are some screens that show about a tenth of what is there. A nice feature is the Weather at the site from the web. I heard some nice things about XWpro and microgrids. We have a snow day here and there is not much going on energy wise below. The new inverter, the gateway, and Insight 2 are available and although not listed in the store here, I am sure they can be ordered from wind/sun and any supplier who does business with Schneider Electric Solar. I just loaded the last production run firmware on xw pro and it seems fine in my offgrid home. !!!!!! DO NOT attempt a firmware upgrade on an XW+ using the Gateway!!!! It will fail partway through and brick the XW+. He also said that the upgrade failing is a known issue. It can be a bug in the gateway or even if the computer looses network connection with the Gateway it can crash the firmware update to the device. From Eric Benson at Schneider "It appears the Gateway does not have the ability to recover a bricked upgrade." He said I need I need a com box or a config tool to use the boot loader to recover the Xw+. I am hopping that they have one to lone me to fix this issue. A smaller bug is that there is a miss print in the manual about the IP address for using WIFI to connect to the Gateway, the manual list's it as 191.168.100.1 but the correct address is 192.168.100.1. As of right now it cannot use WiFi to connect to the internet, the gateway must be hooked up via Ethernet. this is a feature they are working on with a planned firmware update to the Gateway in May and one in June. I know Eric and I have heard of a few bugs. Remember that any new device can have problems with an early adapter. I have not had any issues here but I only do what Engineering tells me to do. I am not really into most of the grid stuff at all, for obvious reasons. The IP addresses are easy to find with a thumb drive into the gateway. We did test the gateway into a cell cradlepoint. It is not hard to unbrick an XW+ but this should not be happening. As with the combox, the user needs to know exactly what they are doing when upgrading firmware. For offgrid there really is not a need to do much firmware updating. When I do it, I am on system B and there is not any AC power connection (or xanbus) with system A that I am updating. My comment to Mike is there was more to that situation he wrote about and I can't comment on it yet. I will when I can. It seemed to be too obvious to have not been tested and caught. But I didn't want someone to flash before the "working on a fix" firmware was done.